Pak Chong travel guide, maps, transports, useful informations, activities, places of interest, Khao Yai national park, Pak Chong, Nakhon Ratchassima province, Thailand. 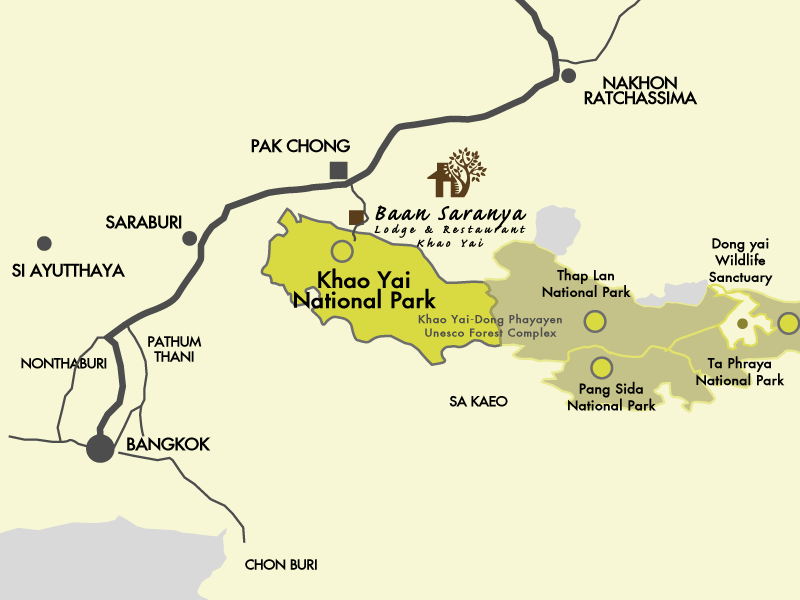 The easiest way to visit Khao Yai park is to use Pak Chong as a transit point for your travel. It’s also the most popular with Thai residents for all the attractions around and the peaceful refreshing landscape. Direction of Victory minivan station: it is located under the expressway bridge crossing Phahon Yothin Rd., 100 meters north of the Victory square, cross the square by the footpath from BTS station up to Phohon Yothin road. Minivans leaves every 2 hours for about 180 Thb per seat. By bus: buses leaves every half hour or so from Mo-Chit north terminal in Bangkok (about 180 Thb). Pak Chong is on the way to Nakhon Ratchassima / Korat, which is the main transit road to Isaan province, so you are sure to always catch a bus easily, just make sure the bus stop in Pak Chong. From Pak Chong, songthaew runs every half hour along Thanarad rd. up the park entrance. -Before Ayutthaya, head north east towards Saraburi. From Eastern Bangkok and the Suvarnabhumi international airport, take the outer ring road up to Phatum Thani to catch the Mittraphap Road leading to Saraburi. -Just before Saraburi, continue the Mittraphap Expressway leading to Nakhon Ratchassima up to Pak Chong, about 45 km from Saraburi. 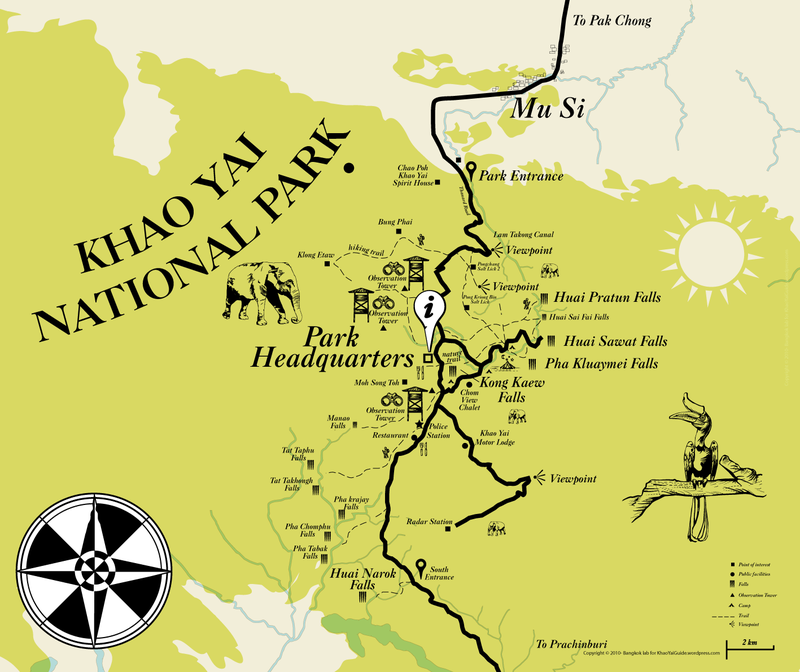 – From Pak Chong, The national park is at the end of Thanarad rd., south of Pak Chong town. The park entrance is about 20 km from the expressway exit, park headquarters are located about 10 km south from the park entrance. By bus: Buses runs every half hour from Korat bus station towards Bangkok and stop in Pak Chong. Songthaew runs permanently along Thanarad rd. up the park entrance. A good option is to rent a motorbike to be able to visit the area at your own pace, bicycle are also available for rent, be aware that once you pass the park gate the park road is mountainous up to the park headquarter. Mountain bike are allowed in the park. Outside the park, there is plenty of nice bicycle Roads threw vineyards and the country. Check futures posts about that. BAAN SARANYA LODGE LOCATION- WHERE WE ARE. By car: The resort is along Thanarad Road at km 13.5. On your right when heading to park, pass St Stephen’s school, Wood Park houses, it s just here, opposite Krua Khao Yai, the most famous restaurant in the area. Bangkok – Baan Saranya Lodge 152 km – 2 hours by car approx. Free pick up service from Pak Chong Bus station is available by advance booking. Private transfer service from Bangkok to Baan Saranya Khao Yai Lodge is available by advance booking.